You'll be £8.00 closer to your next £10.00 credit when you purchase The German Invasion of Norway. What's this? Weserübung was the first combined operation ever where air force, army and navy operated closely together. Troops were transported directly into battle simultaneously by warship and aircraft, and success required co-operation between normally fiercely competing services. It was also the first time that paratroopers were used. The following days were to witness the first dive bomber attack to sink a major warship and the first carrier task-force operations. The narrative is based on primary sources from British, German and Norwegian archives, and it gives a balanced account of the reasons behind the invasion. With its unrivalled collection of photographs, many of which have never before appeared in print, this is a major new WWII history and a definitive account of Germany's first and last major seaborne invasion. The ultimate reference works to the Norwegian campaign and unlikely to be equalled let alone surpassed. This is a highly detailed piece of work, with 400 pages of closely packed text. This has to be the definitive history of the early stages of the German invasion of Norway. A very impressive piece of work that comes highly recommended. 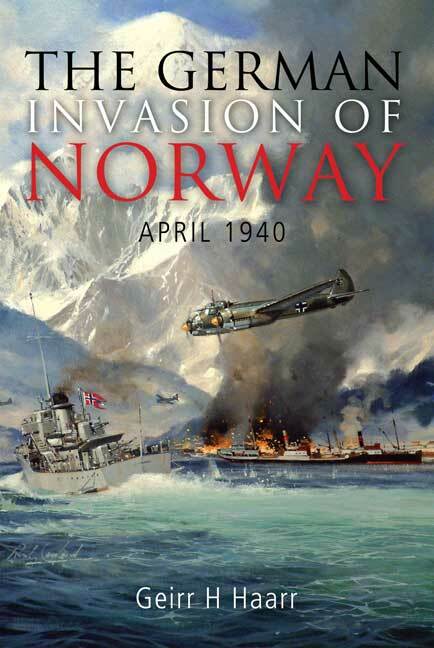 Focusing primarily on the naval operations, 'The German Invasion of Norway, April 1940', Provides readers with an exceptionally detailed and well-documented volume. Drawing from Norwegian, German and British primary sources and archives as well as numerous secondary sources, readers are given a balanced and thorough account of the naval aspect of the invasion. The book provides a highly readable and a compelling narrative of the German Invasion and failure to repulse it. Although previous works have been discussed, the German campaign in Norway and Denmark, what has been missing is an exceptional work from the Norwegian perspective. This volume fills that void. The author not only shows how the operation was viewed by the Norwegians, Germans and British, but also Dane, Swedes, and French. Detailed appendices and numerous black and white photographs significantly enhance the volume, as do charts of operational areas. The work is especially beneficial for readers limited to English. The book fills a needed void in naval studies of the Second World War and naval historians and enthusiasts will not be disappointed. Weseriibung, the German operation that succeeded in the rapid invasion of Norway, saw the Nazi war machine at its most efficient. It was the world's first ever combined operation whereby air, land and sea forces operated collaboratively and simultaneously. This is the author's first book but he has a fine natural talent for maritime history. This is a magnificent work. Very little has been published so far on this important chapter of World War Two. This excellent book more than makes up for that. The first volume of Geirr H. Haarr's tremendous new two-volume work zeroes in on the critical first days of Weserubung and offers a minutely detailed account of the unfolding action. The invasion, the Allied response and the political and strategic backdrop still have much to teach us. The author strikes a careful balance between chronology and geography, covering nearly simultaneous events in separate sections. The volumes are well illustrated with photographs, many published for the first time. Numerous appendices contain orders of battle, lists of ships and key personnel.